My memory of Taima-deraW starts from ‘Nerikuyo-eshiki’, a memorial Buddhist service for Chujo-himeW who was welcomed and taken to reborn in Paradise by 25 BodhisattvasW. I was only a pre-school child when my father and my uncle were taking parts as two of the Bodhisattvas in the service, wearing old masks and unfamiliar old type of kimonosW. I can still remember the old masks placed in the changing room which my father and my uncle were about to wear so well. Ravages of time… darkened in colour, small chips, slight cracks and musty scent. They were scary things for a small child who had fertile imagination. The hole where eyes were made me more scary when they were placed on my father’s face. It was as if something that wasn’t meant to be moving started to move, like the dead reviving. I remember that I started to cry at the busiest moment for those who were about to start their parade on the special built bridge that was stretching out to the crowds of people who gathered to see this special event. My father told me through the mask he was wearing to behave myself but that made the situation worse. The Bodhisattva looking down at me was not my father anymore but something that seems to know all the things that I did wrong. I was too scared to confess nor had an idea to calm myself down to reconsider the procedure of Bodhisattva’s appearance. Soon, I was taken out of the room by my mother to the place where we could see the parade as audiences. The Bodhisattvas paraded on the bridge were not of what I saw in the changing room any more. Under the sun, they were colourful and bright. I felt that they were ‘living’ and not ‘dead’ anymore which wiped out my fear I was feeling few minutes ago. I stopped crying and started to concentrate on the parade that was taking place in front of me like others in the crowd. ‘Nerikuyo-eshiki’ of Taima-dera taken place every 14th May, a date when Chujo-hime departed off to the Land of Ultimate Bliss. Masks were replaced with new ones in 2005 after the 1,000th anniversary of the service the year before. Photo from ‘Hotel Sunroute-Nara staff Official Blog‘. It was several years after that when I knew the parade was for Chujo-hime, a daughter of an aristocrat, Fujiwara no ToyonariW. Taima-dera has been widely known to the public by the legend of this woman who attracted classical playwrights and modern novelists as well as the woven Taima MandalaW which became the principal object of worship by its vogue, despite the Buddha that was meant to be the central figure in the temple. Chuji-hime and her step-mother disguised in a snake. 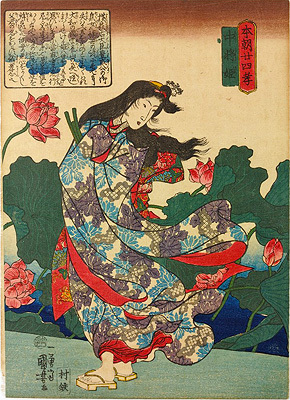 Drawn by Yoshitoshi Tsukioka. 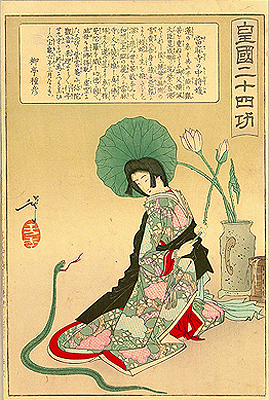 Chujo-hime drawn as an ‘Edo-beauty’. The dramatic life which stimulated the curiosities of playwrights and novelists of hers seems to be a ‘sibylline’ happy end life after dooms which was not of a noble daughter’s. Her first tragedy was being bullied by her step-mother when she was 5 years old. When she was 14, she fled to Mount Hibari in Uda, NaraW where she lived in seclusion until her father brought her back home. While she was living in Mount Hibari, she soothed her heart by reciting sutraW which, after returning home, set herself to copy 1,000 volumes of sutura books. It was at the age of 16 when she was offered by Emperor JunninW to become one of the consorts but refused to, worked harder to reinforce her religious faith. It was not long after that when she was lead by KannonW to the foot of Mount Nijo where Taima-dera stood after seeing a sibylline vision of AmitabhaW with the Land of Ultimate Bliss. 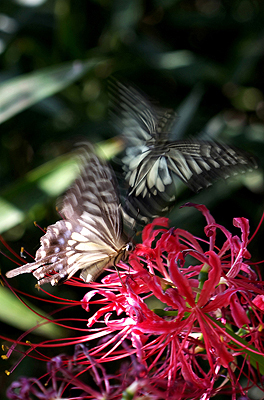 As a nun in Taima-dera, she lives an austere and meditative life. It was after becoming a nun that she wove Taima Mandala from lotus threads through Kannnon’s revelation in one night. The Mandala portrayed the Land of Ultimate Bliss which she saw on the day she was guided to Taima-dera. The legend has been passing the story of Chujo-hime preaching the teachings of Pure Land BuddhismW to the public through the Mandala she wove and her departure alive to the Land of Ultimate Bliss with 25 Bodhisattvas who came to guide her way at her age of 29. 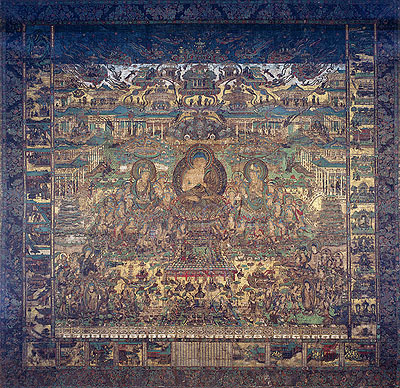 ‘Taima Mandala’, thrid copy made in 1502, apporximately 4 meters square. The original made in 5th century still exixsts but isn’t exhibited. Photo from ‘ by Bijutsu tanbo Artnews‘. 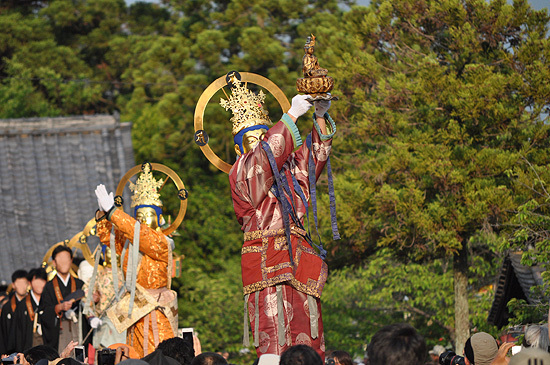 Because of Chujo-hime, Taima-dera has been the focus of women’s worship in Buddhism for many years as in the Buddhism’s early days, from the time when women were thought that they could not attain BuddhahoodW, meaning simply that women cannot enter the Land of Ultimate Bliss. It was after Chujo-hime, the woman who entered the Pure Land, welcomed by the Bodhisattvas and Amitabha, that the women came to have some sort of proof that they were also the target of Buddha’s salvation whose lives in this world may have been unrelieved tragedy. 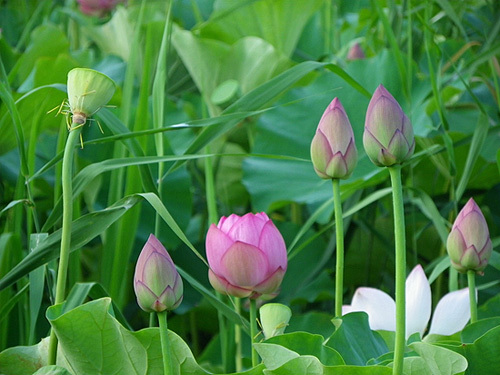 Lotus as a symbol for Buddhism but Chujo-hime to me….. While Buddhism took its root and spread in several denominations in Japan, there were times that women were thought to have no chance to enter the Land of Ultimate Bliss. But would that really be a despairing fact for women at that time? If I were them, I could have taken the offensive and may have done what I wanted to do and disobey the patriarch who wanted to thrive the clan by using me somehow. By doing so, I can accept the fact that I cannot enter the Land without any discontent. Of course, this is my simple-mindedness without considering the background and educational influence of that time. Still, in the time when death is more close in daily circumstance, they could have been less afraid of dying than us today and had some kind of readiness or resignation even they knew little on Buddhism, ShintoW or other religious teachings. If these were the mental cases of women at that time, the popularity of Chujo-hime among women from the past does not only rely on the story of Chujo-hime entering the Land of Ultimate Bliss as a woman. One of the glamour that Chujo-hime has which attracts me the most is her eagerness. 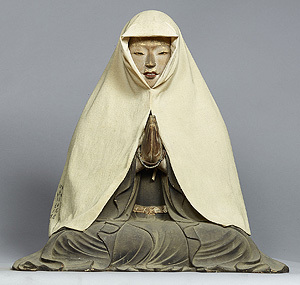 Various anecdotes of Chujo-hime which we find today are hard to inspect the facts but if I were to comply with the point that Chujo-hime became a nun of her own accord and not of her patriarch’s, she was a woman who carried out her intention. If the proposal of becoming one of the consorts of the Emperor or similar sort of men which seems to be planned by the patriarchs to the thriving of the Court and clans was a fact, rejecting the man whom she didn’t fancy or refusing the order of her patriarch, and became a nun is an aggressive attitude as a woman at that time which could have given a courage to women who were suffering from their difficult situations. My hopeful imagination leads me of her having a man she truly loved but could not espouse in some reason, became a nun to keep her chastity as a proof of her love to him forever which could have also been an imagination to some women in the past who may have been encouraged on their own love affairs. Holy statue of Chujo-hime in Taima-dera. Photo from ‘Bijutsu tanbo Artnews‘. Looking out over beautiful nature, what did Chujo-hime think about….? Chujo-hime is a saint but taking a close look at the holy statue of Chujo-hime in Taima-dera which evokes lifelike images and still has womanly attractiveness with her mouth slightly open, she seems to be nearer to me than any other saints or Buddha in the temple. Because of this image, I can imagine a scene of Chujo-hime preaching in front of the Taima Mandala to women who gathered for help and comfort, giving hints to live their lives as women in peace. There may have been some time of women asking for Chujo-hime’s advice on love. Or Chujo-hime might be asked about her own love in the past, said nothing but smiled back, looking at one of the beautiful Bodhisattva who looked a bit like the love she keeps to herself. I know I shouldn’t be positioning her as a flesh-and-blood character as she is a saint but cannot stop feeling so and it may have been to many women from the past until today which I postulate as one of the reasons that she has been achieving popularity among women. Thinking back at the first time I saw ‘Nerikuyo-eshiki’ parade when I was a child, for some reason or other, I was feeling a relief when the Bodhisattvas started to march under the sun because it was just like the moment when Cinderella was saved with the magic spell of the fairy godmother, turning pumpkin into a carriage, mice into horses, a rat into a coachman and lizards into footmen. Hoping that where she was taken to was where her Prince Charming awaits….., the Bodhisattva or the Amitabha.